Q: What are the key challenges for patients who struggle with weight? Exercise – schedule it into your daily routine. Be “selfish” for your health. Q: How do you start the conversation with patients who need to lose weight? A: As part of their exam, I ask, “So what are you doing for exercise?” Often patients tell me they don’t have time to exercise; this is where I encourage them to be selfish. If you set aside a regular time to exercise, and let your family and friends know, they’ll respect that schedule and not distract you from your goal. Q: In addition to eating on a regular schedule, how big a part does nutrition play? A: Nutrition plays a central role. I emphasize the importance of eating healthy – more protein, healthy snacks; less sugar and processed foods. I also recommend using myfitnesspal.com, a free online weight loss tool. And for patients willing to share their password, there’s even the capability for their doctor to see what they’re eating, and provide feedback and guidance in their weight loss process. A: Soon, the Arundel Mills office will launch a program dedicated to improving patients’ health through lifestyle changes, so we’re excited about this opportunity to help more individuals achieve their goals. 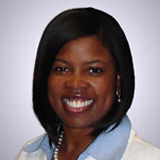 Falana P. Carter, M.D. joined Maryland Primary Care Physicians, Arundel Mills in 2011 and is certified by the American Board of Family Physicians. She received her medical degree from University of South Florida College of Medicine in 2001 and completed her residency program in Family Medicine at Portsmouth Family Medicine, Eastern Virginia Medical School in 2004.